This is a highly simplified article of a much more complex field of interest with a lot of comparative evaluation between certain lighting technologies. This should not be used as a platform for design, engineering or legal argument. It is intended and written for information purposes only. When you have been involved in a crash, you have to go to a police station to fill in an Officer’s Accident Report (AR) Form. You will notice that - in this form, you need to fill in spaces relating to day/night. Whether the collision occurred in the day or at night. In layman’s terms, it couldn’t be simpler. Was it dark or was there light. Could you see or not. But is it really this simple? Can you truly make a determination as to whether someone could see - TRULY SEE - simply by whether there were lights, or not? The truth is no - it is actually much more complicated than this. There are human and (lighting engineering) factors that stretch far beyond the lay understanding of lighting. This is a lay description of how lighting is interpreted for the purpose of collision analysis involving lighting as an actual or possible factor. What you see is the result of light striking the inside of your eye through the black hole you see when you look in a mirror - your pupil. This little hole is not constant and can vary in size. Even more importantly the Left and Right pupils can dilate at differing rates and to different diameters. You can do a test to see this. Stand in front of a mirror, then close one eye for about 30 seconds and remove your hand then look in the mirror. You will see that the pupil dilation will be different for each eye. The way in which this works is that less light results in your pupil dilating more to let in more light. At the same time, if you experience bright light, your pupils will contract and thus prevent too much light entering the eye. This automated system is constantly trying to balance the amount of light entering the eye I relation to the intensity of the light to enable you to see perfectly under varying conditions. The problem is that this same system can conspire to render you vulnerable at night as you get older. 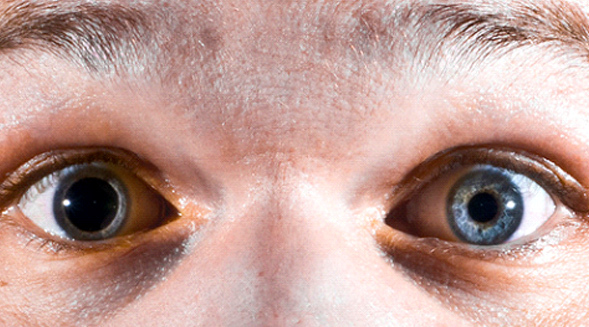 In the average (healthy) person, the pupil can dilate or contract in a second or two. If an approaching vehicle’s lights then shine into your eyes at night, your eyes will adjust and contract your pupils, cutting out some of the glare and making it possible for you to see better. But - as you get older, this reaction slows down to as much as 10 or 15 seconds, depending on the full effect of ageing (and a variety of physiological factors). This means that - as the vehicle now approached with its lights on, your pupils will not contract quickly enough. This results in over-exposure and you are thus “blinded” by the approaching vehicle. This causes a dazzle-effect and leaves an after-effect (light spots) rendering your vision impaired while your eyes and the visual system attempts to cope with this over-exposure. After this, the other car passes but your pupils are still dilating. Now those lights go away and your pupils need to dilate again to allow in more light to allow you to see under the lower lighting. Again - because of the slower reaction of the pupil, you would now be “night-blind” for up to 15 seconds as your aged pupils dilate slowly again. In total, this effect could influence your ability to see properly for as long as 30 seconds or more. If a pedestrian stepped out, if a vehicle stopped ahead of you or if there is a bend in the road, you could be in grave danger. But this deterioration in your visual system happens so gradually and over so many years that you would probably not even be aware that this is happening until you think hard, after reading this. In spite of this, your eye will also experience a reduction in light sensitivity over time. Like an old tube television set, you “need to turn up the dials more and more to see the same quality picture.” This reduction in visual acuity affects us also as a function of natural ageing. As your slower-reacting pupils and less sensitive visual perception (light sensitivity) conspire, you will start to experience acute night blindness. 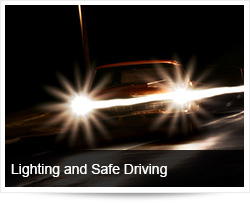 You will start to notice that driving at night becomes onerous and even uncomfortable. By the time you need to blink lots of times after an approaching vehicle has passed, the effects will have started and you should be aware of this. 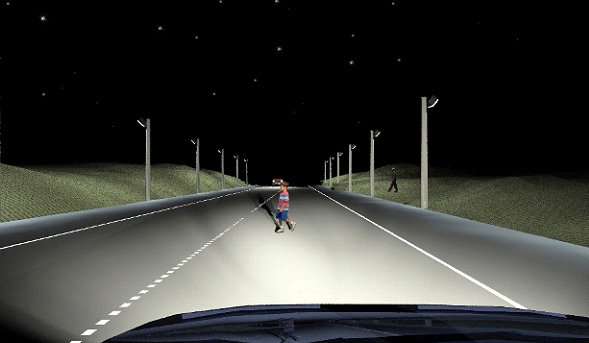 One way of trying to counteract this effect is to close one eye as a vehicle approaches at night (left and right pupils can dilate do different diameters, remember) and then to close that eye and open the other as soon as the vehicle passes. This will result in the exposed eye being over-exposed, but the closed eye (in darker conditions) pupil will have dilated more, giving you a better chance of seeing under the lower light after a vehicle has passed. But within limits, of course, depending on many factors. That takes care of the immediate physical human factor, as far as light sensitivity goes. Are all street lights created equal? Remember that the Accident Report (AR) Form only had an option for “lit by street lights.” There is no reference to any consideration for the TYPE of lighting installed on a particular piece of road. In layman’s terms, you would imagine that lights there is better than no lights there, right? Well - not really, in all cases. In order for us to determine if the mere presence of light is all that needs to be considered, we need to consider a variety of lighting principles that affect this concept. Sunlight (as we are all surely aware) can be described as “optimal.” We are “built” to see under ideal (sunlight) conditions. In order for us to truly consider the “quality” of street lights, we need to understand why sunlight is so “good” to us. First, there is the issue of the frequency of visible light. We can see only a specific part of available light, between Ultra Violet and Infra Red. UltraViolet is closer to the "radio-active" frequency range and Infrared closer to the “heat” range. We can only see the light that falls between these extremes. Everything outside of our limited field of colour detection is invisible to us. On the one side we have light beyond blue (Ultra Violet) and on the other end the light beyond red (Infra-red) that we cannot see anymore. We only see the lights at the frequencies in between - this is visible light. If the amount of light reaching us is the same across the whole frequency, we have WHITE light. But the truth is that nothing we experience now - including sunlight, is truly perfectly “white.” But for our purposes, white light is the same amount of light across the whole spectrum. If you look at the chart above, you will see that it indicates our sensitivity to lights at varying frequencies. We experience reds a bit less intense than greens and blues. This is why the experience is so psychedelic in discos and nightclubs where they have those “black lights” on. The amount of light emitted by the sun (which is not perfectly white, but nicely balanced for our perception) falls largely within the visual range, as we experience it. This is why we see so well in the day. Most highways are fitted with one of several types of lighting solutions. The type we are concerned about (as part of this discussion) is High-Pressure Sodium Lights. You will recognise these easily with their orange glow. High-Pressure Sodium lights are relatively cheap, they last relatively long and they (typically) consume less power than other types of lighting (for the same “wattage”), keeping costs down. Municipalities typically use these for those reasons. They are considered the most cost-effective solution. But money is not all that is at stake at all. See - while the High-Pressure Sodium Light might be a 400W light, the truth is that a lot of that 400w (of energy) is effectively WASTED on converting electricity to heat and into light in the INVISIBLE light spectrum. This means that a 400W HPS light might only actually radiate about 270W of VISIBLE light. These also take some time to start up (burning much more than 400W of energy). So - although they are “cheaper to buy” and therefore “easier to sell” they hardly generate the best “pound for your buck” in terms of the amount of light actually delivered. High-Intensity Discharge lamps (also 400W), on the other hand, produce more VISIBLE light, is whiter in appearance (and therefore better for humans). But they cost more and don’t last as long. Engineers want to install more lights. They need to make more money. So - they install HPS, which produces less VISIBLE LIGHT. This also means you need more of these lights for the same stretch of roads. But they go on poles - so you also sell more poles. And more cabling and this takes more labour. So more money is converted to “profit.” They will “sell” the idea that these lamps last longer (they have a longer life expectancy) but the truth is that they last only a little bit longer than others. These are the municipalities and road section managers that “spend the money.” They operate on a budget. It is easier for them to budget for long-term maintenance than it is to justify double the cost for the initial installation. They are also “in” on the “conspiracy,” since they know that these lights produce “poor light” but they don’t have enough information, knowledge or understanding to decide which lights are best for ROAD SAFETY. We, humans, are blissfully unaware of the situation and the associated risks. Our eyes are so advanced that - to us - when there is light, there is light and the eye will simply adapt and adjust to make us “see as well as we possibly can.” People wouldn’t typically drive into a section of road with HPS lights installed and even give the colour and its effects on perception any thought. They never even consider it. We just drone on, blissfully unaware and without any change in mentality or vigilance. Now we have to get a bit technical but bear with us. This is important stuff. Inside your eye, there are two different kinds of sensors. One type (rods) only sense light (intensity) and another kind (cones) sense colours in the Red, Green and Blue spectrum. The rods outnumber the cones by roughly 2.5 to 1. This means that there are roughly 2.5 times as many rods as there are cones. This is very significant and explains why we tend to see in muted colours or in mere outlines as lighting intensity drops. In the darkness, it is almost like seeing only shadows, but you will see that - in very dark conditions - you can actually “see” a bit better in the periphery of your vision. You can try this on a very dark night, looking a single light source, like a very small star. If you look straight at it, it seems to be invisible, but when you look to the side, it becomes more visible. This is because the number of cones is denser around the centre of your field of vision. Now - when you are exposed to light that is visible but does not stimulate enough of all three colours of cones and the rods in just the right ratio, you get a poor S/P ratio. 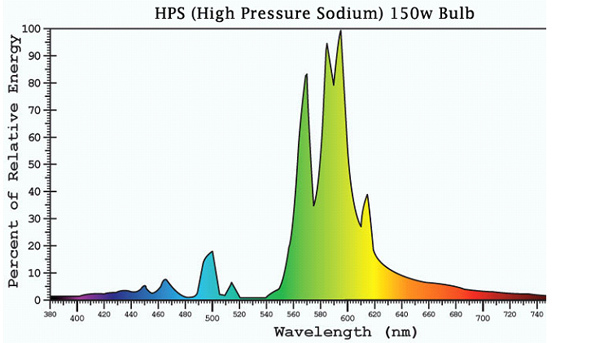 Looking at the above chart, you will see that Sodium lights have the poorest S/P Ratio of all artificial light types. You will see that the S/P Ratio of the sun is (roughly) 2.5. Or almost exactly equal to the ratio between rods and cones in your eye. As this ratio drops, you need more and more rods to see properly - but this is a double-edged sword. A light of poor S/P Ratio will result in your eye “seeing” more light but of the WRONG colour. This results in your pupils trying to dilate (since the cones are not being stimulated adequately) and this further “over-exposes” the rods. If you stand in a shipyard, between containers, where there are HPS lamps installed, you will see that you see poorly (at best) in lit areas while the shadows now seem EXTREMELY dark. You could stand two feet from someone in a brightly lit area and not see them standing in a shadow almost right next to you. 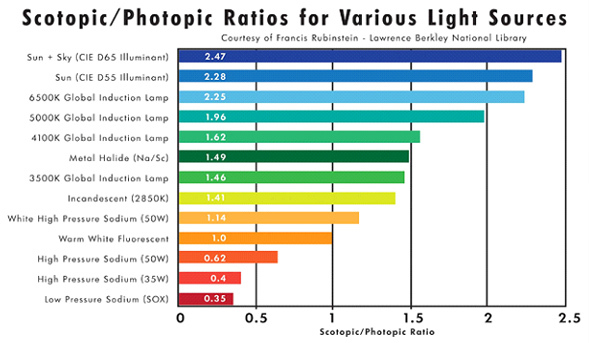 You can see from this chart that the light distribution is very narrow for HPS lamps. This means you are getting light, but “seeing less." Another problem with HPS and other types of fluorescent lights are…. You may not be able to sense it, but most Fluorescent and Discharge lamps are actually flickering at a high frequency. While you may not be able to see this, your eyes will fatigue quickly, this flicker can cause concentration, focus and even balance impairment. Since we know that people can suffer from epileptic fits from flicker, this is a risk that needs to be considered when installing lighting where vehicles move at over 100 Km/h. It is also known that the same effect and the fits can be experienced by some drivers where the sun flashes in-between trees on a country road. So - why do developers keep planting rows of trees along highways? Because they look pretty, of course! The place where you will see this the easiest is when you watch a vehicle wheel with spokes that are turning. 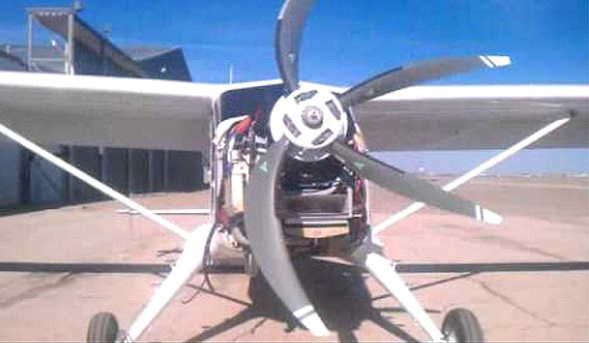 The same for aircraft propellers. At some point, the wheel will tend to slow down and stop and then it starts seemingly turning in the opposite direction. This means that - in factories where there are loud machines - workers might have no auditory cue as to which machines are operational (turning) and which are not. The presence of the stroboscopic effect here can then lead to a worker placing his hands on a machine that seems to be standing still when in fact it is not. This can also influence drivers but to a lesser effect. But drivers are not affected by stroboscopic effect directly - so what’s the point of mentioning this? VCP is a number that expresses the relative “comfort” with which concentration and attention span can be used to optimum effect for the longest time, without causing fatigue, disinterest, failure to concentrate and/or a decrease in judgement. Under poor lighting conditions or any environment that “strains” visual perception, the efficiency of work, concentration, task-attention, detection and even intellectual efficiency can be negatively impacted. Whether it is caused by glare, low light, over-exposure, flicker, bad S/P Ratio or long exposure to the same environment (think classrooms), a low VCP can affect performance. This means that HPS lighting (with lower visible light emission per watt), a very poor S/P Ratio, Flicker and glare (since there are more needed) will result in a very low VCP rating as well. But where’s all this going? Well - yes and no. You see - where HPS lamps are installed there is more “light.” But this light is of so poor a quality and the S/P Ratio (and colour) so bad, that the human eyes are forced to perform under unnatural conditions. This can lead to a wide variety of visual and anomalous impairments from peripheral blindness to the need for over-concentration just to detect bodies (remember - contrast is very exaggerated under poor S/P lighting conditions). They are whiter and stimulate the eyes better, in terms of perception. They have better VCP ratings. They are more intense (as a function of directional illumination). They illuminate all colours more equally than HPS does. This means that the PRESENCE of HPS lamps can actually lead to POORER vision in certain conditions and this CAN lead to poorer visual performance. If ROAD SAFETY is truly a goal, the lighting solutions used on roads should become a critical factor in road engineering - at least as far as the selection of lighting technologies are concerned.